As a seasoned rider, my friends often want to get in on the action, so I usually offer them plenty of advice to stay safe and have fun. Learning how to ride a motorcycle requires a lot of practice, especially when it comes to safety. The first thing you need to consider as a first-time rider is to wear appropriate safety gear, such as a quality helmet. The other precautionary safety measures include: gaining the necessary riding experience, performing regular bike checks and maintenance, riding within the acceptable speed limit and familiarizing yourself with your bike and the road you intend to use. Riders must also familiarize themselves with such rules as noise limits, insurance requirements, express lane rules and passenger rules. Before riding a bike, motorbike riders must first obtain either a motorcycle learner’s permit or a riding permit from the Department of Motor Vehicle (DMV). The permit is obtained after passing a state administered written test. Bikes are classified under many categories depending on use; the most common categories include sports bikes, basic bikes and cruisers. To fully familiarize yourself with your motorcycle, you must understand the function of some of the key components and controls. These functions include the fuel and speed gauge, right-side handler bar accelerator control, foot-pedal gear shifter, right-side handlebar brake control and the left-side handlebar clutch. 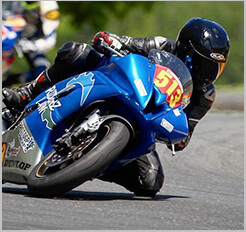 A professional motorbike rider can assist you learn how to start, accelerate and decelerate your motorcycle. The other important functions every beginner needs to learn include: braking, stopping, parking and shifting. After you have become comfortable on the wheels, you can pick an isolated street to practice. Once you can ride on your own, there are a couple things you need to understand as a first-time rider. You should learn to focus on where you are going, learn how to turn off your choke (if equipped), perform pre-inspections, adjust the mirrors and it's a good idea to estimate your MPG and fuel capacity. Many bikes will use a motorcycle choke for starting when cold. However, having the choke on for too long can cause your bike to run rich and use a bit too much gas; for this reason it is always wise to turn the choke off. Performing a motorcycle pre-inspection is another important step to remember before starting a ride. Most motorcycles are generally belt-powered, chain-powered or shaft-powered. Always check to see if any of these connectors are in place, improperly placed or broken. Before starting the engine, you should check the motorcycle mirror and adjust accordingly. You can activate your bikes center stand to get a better angle to make the adjustment. Checking your bikes fuel gauge is very important because some bikes, especially the old models, may not work properly. If you can estimate your bikes MPG and fuel capacity accurately, you will avoid getting stuck in the middle of nowhere with no gas. If your motorcycle is carbureted, it is likely that the fuel lock valve will be set in three positions; On, Off and Res. The valve controls the amount of fuel entering our engine; if the valve is turned off, the engine will be starved of fuel. The other important things to mind when riding a motorcycle as a beginner is to check the condition of your tires, select footwear with good traction and dress in layers to help you withstand the wind and stay safe. With these tips, I can watch as my friends select a bike and have a great and safe time while out on the trails or roads of Southern California.